When I read, before I even listened to their songs, that the Mojo Waves come from Vantaa (Finland) I already knew that I would be faced with something extreme and very hot. I had to look the city up on the map and to judge its proximity Sweden, the incredible source of great rock music of the last few years. Ok, now the geographical/cultural journey is complete, I can deal with the two Mojo Waves EP Enjoy, Don’t Destroy and what comes to my ears does not betray my expectations; Rock’n’roll, power and desire to innovate. While I immediately hear the influence of power 70s rock (Black Sabbath, Led Zeppelin, Cream) and modern ones (Wolfmother, above all) it feels that the three young Finns want to bring their music to a different level, moving like a train ready to crash at full speed. The unconventional way they play, albeit anchored in solid rock foundation, absolutely reminds me of a Dutch progressive band from the 70’s, Focus. The power of songs like “Yeasayer” and “I am a Chameleon” lead me back to legendary tracks such as “Sylvia” and “Hocus Pocus” (The latter is contained in the album Focus II or, as it was originally called, Moving Wave – is it an incredible coincidence or a deliberate homage?). The fact is that the mix of power rock guitars, pure heavy metal vocals and a true garage attitude (Mojo Waves recorded their first two EPs at home and are proud to underline it) creates something slightly difficult to identify despite being incredibly familiar. Proving just how amazing it is that in 2012 there are still people who can come up with something new. 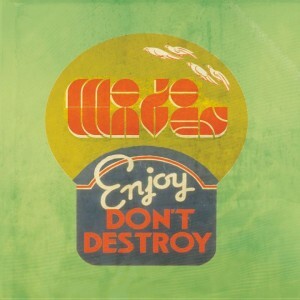 If you’re in the wrong mood, Enjoy, Don’t Destroy comes across really hard and raw. But when you’re ready for it, they are able to bring a perfect “Mojo Waves Live Experience” into your stereo… where you can feel the pure rock’n’roll rage, blood on the pick guards and sweat on stage. Looking at the past many bands have taken their spin on the genre to the extreme and they have ended up creating important chapters in the history of Rock. Will Mojo Waves? In the meantime, don’t miss the opportunity to hear them. This entry was posted in Reviews and tagged Enjoy Don't Destory, Mojo Waves, music, nanobot, review, Rock, soundcloud by Greg. Bookmark the permalink.